In the morning went to Bicycle Entrepreneur and we stripped my bicycle down to the frame. Frame goes with me to the US and the rest stays here with better components to be swapped onto my other bike. Went back to the Maritime Museum and saw a well done film about the Batavia. Otherwise, walked around town, stopping briefly at Bike Force, the other bike shop in town. In the evening, sorted through stuff to decide what to take on my brief trip back to the US. Left my camping gear and computer gear in Geraldton, but took bike helmet and tools with me. Hopefully can ride the other bike from Perth northbound on the return. My Perth to Sydney flight was listed as United, though flown as Ansett. Gate personnel had guidelines from United to charge $AUS 100 for a bicycle. I protested, since United had counted a bike as a piece of luggage on international flights...and this was a Perth to SF international flight. By now I've paid as much in airline fees for this bicycle as I paid for the bike. If it were a painting, golf clubs or similar size/weight, then no charge... Must have asked in the right way because after seeing the total luggage was only 21.5 kg, they let it on without a fee. Uneventful red-eye flight to Sydney. On arrival, discovered that United to San Francisco was listed as eight hours late (already!, these delays typically don't shrink), so rerouted via Los Angeles. Delayed anyways into SF due to fog. A few unexpected days in the Bay Area. I wanted to rent a vehicle "big enough to carry my bicycle" and ended up with a huge 4WD SUV lumbering on crowded Bay Area roads. Driving on the right wasn't too hard to get used to, but the volume of traffic surprised me again. I also eased my outback withdrawal syndrome with a "Slim Dusty" CD I'd bought in Australia. My primary mission was to exchange bicycles and that was quickly accomplished. I had to stay five nights to get my airline fare, otherwise it would have been a much shorter stay. I got my second Cannondale bike out of storage at my condo, added a new heavy duty wheel (built before the trip and shipped from Colorado) and adjusted everything for riding. This bike is not as nice as my other bike, but it will do for now. I left my broken frame at Calmar bike shop for them to assist in pursuing a warranty claim. Otherwise looked around some. Three changes I found in my quick visits to Silicon Valley: 1) RAM prices much much cheaper and >1 GHz systems available 2) recession still happening with tech companies and the tech news, e.g. yesterdays darlings like Ariba are now boom/bust stories 3) HP had a year-to-year decline in Q3 revenues...leading to 6000 layoffs and some just hitting my coworkers, scary stuff, particularly on LOA...Will see how things are after another six months. Was fortunate and grateful to have my brother, Rob, and sister in law, Natalie, in the area. Stayed at their place in Pleasant Hill. We had a fun hike on Point Reyes along the California coast on August 26th. A little longer than expected when, within sight of the parking lot, we ended up on a two mile detour. Otherwise, visited with friends, browsed the web, stopped by work, visited Linux show and made my obligatory Frys Computer visits. Got myself quickly adjusted to jet lag and nine hours of time change...ready for the trip back and restless to start riding again. Left the new international terminal at SFO. No bike boxes there, though they got me one from domestic terminal. This was good and bad, as this also meant I had "help" boxing the bike and said help took off my front wheel...leaving me concerned about less protection in front fork if airlines throw heavy stuff on top of the box. August 29th almost disappeared across the dateline. Uneventful flight to Sydney. A 747-400 less than half full and slightly ahead of schedule. Once on the ground, a very rushed transfer. I had an hour and a half to leave the plane, clear customs, wait for baggage, pass agricultural quarantine check, check into the domestic flight and ride the shuttle bus to the other terminal. It all went smoothly, but still involved waiting in five queues for service as well as for baggage. The agricultural sniffer dog found smells of an orange from our hiking trip the previous weekend. Bike box was somewhat torn but otherwise ok. Uneventful flight to Perth. Finally after 21 hours of travel and +15 hours of time change, back in Western Australia again! The Perth sniffer dog didn't detect orange remnants as much as in Sydney. I assembled the bicycle, filled water bottles and cycled off. The airport is already out of town, so followed signs to Midland. Lots of traffic on the road and several turns to follow. Once out of Midland, the Swan River Valley had several vineyards and wineries. Slight tailwinds to blow me along. Bike was lightly loaded and glided well. Gears not quite in adjustment, but good enough for now. Also adjustment to front brake cable had broken during flight. Stopped at Bullsbrook not far down the road. I was at least out of town, and didn't want to ride too far under jet lag. Bullsbrook had a pub, supermarket and some small stores. Picked up a local newspaper to catch up from when I was last in WA. Nice to be riding again. 35 km today, 14946 km cumulative. Easy riding today. I have less than half the load that I'll soon get with camping gear, computer gear and rest of my tools. It rained overnight and drizzled much of the first 30 km. Seemed like I was chasing a drizzle cloud northbound. Bullsbrook had a RAAF base and there was one near Gin Gin as well. Mostly pasture lands with some forests. A mixture of sheep, goats and cattle. Route was mostly flat, though followed a low range of hills. Reasonable amounts of traffic starting out. After 11 km the road split and I turned left to follow the more direct route to Geraldton. A bacon and egg sandwich stop at Muchea allowed the drizzle cloud to go ahead for a while. 25 km further I took the turnoff for Gin Gin and had small climbs for 6 km into town. Gin Gin had a nice town center, an old church, a waterwheel and a row of shops. Had brekky at the cafe. As I finished the sun came out for the day. Rode back to the Brand Highway and headed north. Another 44 km brought me to Reagan's Ford Windmill Roadhouse. Giant 30 ft blades on the windmill. Fortunately not turning much in the mostly calm air. The roadhouse was for sale, though didn't ask how much. Final ride brought me to Cataby. Saw an Ampol Roadhouse (open 25 hours, 8 days a week!) but something didn't seem quite right. Kept going and found the BP roadhouse another 3 km further. Stayed in motel here as there was not another motel for a while. In the afternoon, the Greyhound bus stopped here for late lunch, similar to eight days before when I'd ridden the bus. Today marks six months on the road and 15000+ km of cycling. For the next six months, plan has changed slightly from that listed in the plan page. I'll still be in Australia until 21 December and then in Hawaii to climb Mauna Kea for New Year. 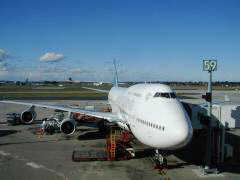 I fly to Chennai, India on January 5th and from there to Auckland, New Zealand on February 3rd. Return to the Bay Area on the evening of the last day of my year long leave, February 28th. 122 km today, 15068 km cumulative.